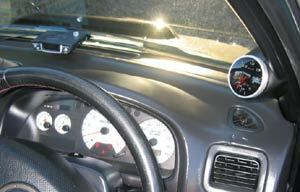 Defi-Link Meters are electronic gauges which are high response and refined design. controlled by one Control Unit II. The name of the connection system is "Defi-Link System." 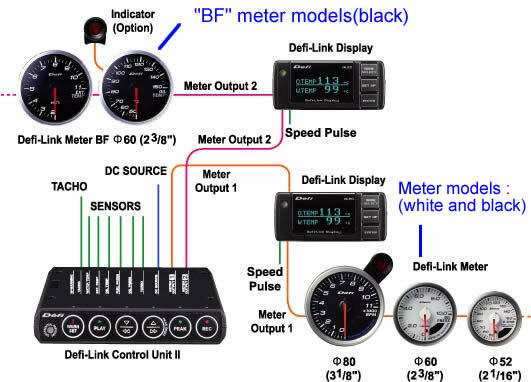 Defi-Link System allows gauges to be attached to Defi-Link Control Unit II with a single "DAISY CHAIN" wiring system. is discretionary with the Control Unit II. 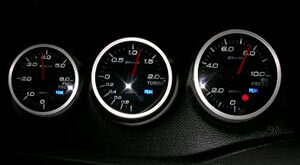 The other LED illuminates when the gauge pointer exceeds a past maximum value. # Gorgeous Opening Mode and Closing Mode. 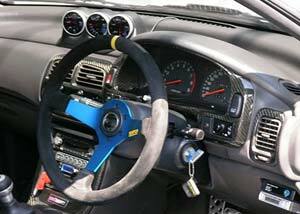 # Driving data can be stored up to 3 minutes and can be replayed. # Double Warning function by LED Lamp and a beep. 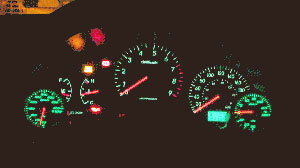 # Brightness can be adjusted. 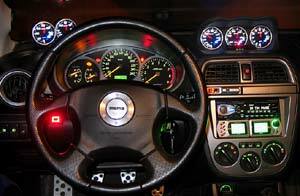 # If Defi-Link Indicator (Sold Seperately) is connected, it blinks when any of connected meter's warning LED lights is on. 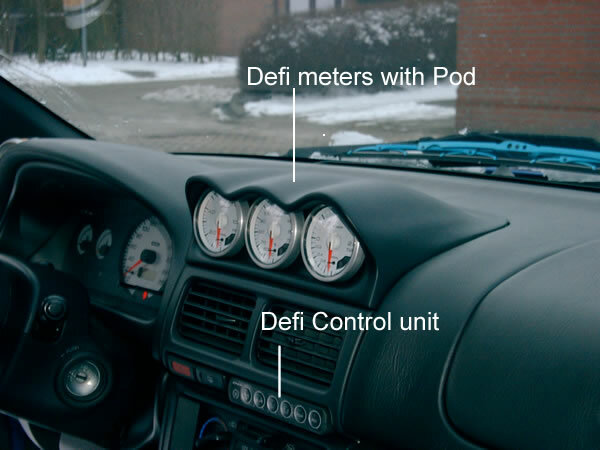 # Defi-Link Indicator can be connected with each meter. 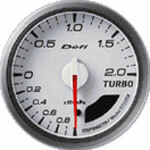 # Differential Pressure between fuel pressure and turbo can be shown. 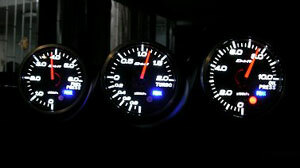 -- (standard) black or white 52/60 mm or ..
A new design gauge, for use with Control Unit II. Looks completely black when off, illuminates when ignition turned on. Has seperate startup (self diagnosis) and closedown routines. Another step forward in style and stealth. 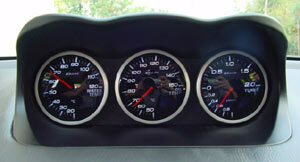 Below you will see 2 graphics showing the opening and closing sequence of the Defi BF series of gauges. 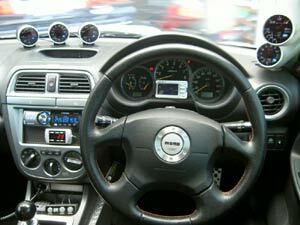 Defi Products:Defi-Link Meter BF series : turbo, oil temp and water temp. 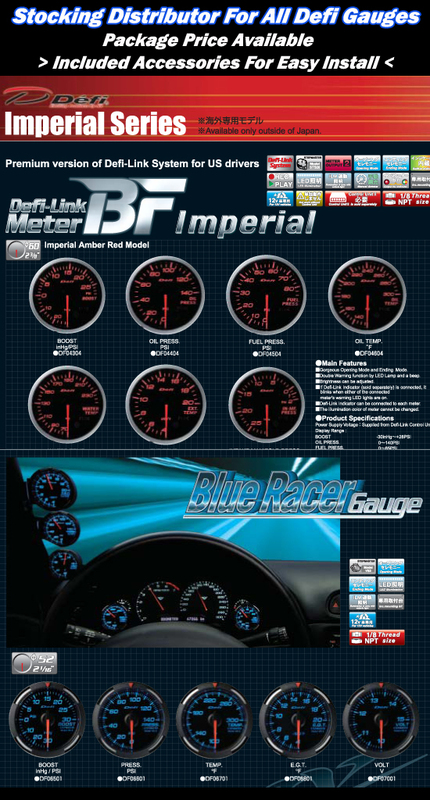 Defi Products:Defi-Link Meter BF Boost, Fuel Pressure, Oil Pressure and control unit II. 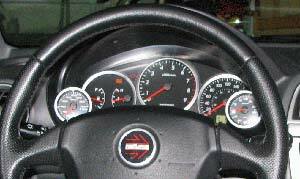 Boost, Fuel Press, Oil press, Oil temp, EGT. 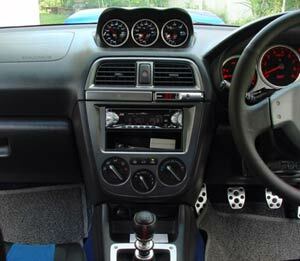 ControlUnit II and Triple meter food for New Age Impreza. 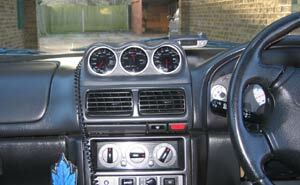 Oil Temp, Oil Pressure, Fuel Pressure Exhaust Temp, Boost and Defi-Link Control Unit ll. 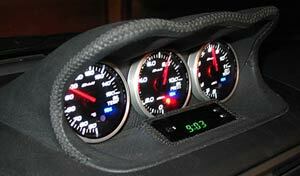 Defi Products:Defi-Link Meter BF water temp, oil temp, oil pressure, and turbo gauge.